Les Misérables was the first musical I loved. I’d performed musical theater as a kid and had seen a few professional shows in Atlanta and on Broadway, but it wasn’t until I was a young adult, seeing Boublil & Schönberg’s adaptation of Victor Hugo’s novel for the first time at Atlanta’s Fox Theatre, that a story told in musical form would move me so deeply. Les Mis returned to the Fox last night for a six-day run as part of the Broadway in Atlanta series. Cameron Mackintosh’s production brings 19th century France to life with a combination of intricate wooden sets for the villages, barricades and Paris tenements, and smoke-and-projections for scenes in the sewers. What hasn’t changed in the decades since its release is the intensity of the story and the emotion in the songs. Poverty and death; justice and mercy; sexual harassment and predation; unrequited passion and love at first sight; freedom from oppression; hatred and redemption. The play seems to take its cues as much from opera as contemporary Broadway. It’s been copied and parodied incessantly since its 1985 debut (my favorite is an exchange from Something Rotten: “Some plays have no talking at all.” “No talking? ... Sounds miserable.” “I believe it’s pronounced ‘misérables.’”) But neither time nor the latest cultural developments can blunt the play’s edge. The show’s other stand-out performance last night was newcomer Paige Smallwood as Éponine, whose easy charm and gorgeous vocals on “On My Own” made me wonder—and not for the first time—how Marius could be so blind to what’s in front of him, but that speaks to the play’s class politics. Almost the entirety of Les Mis’ humor comes from Thénardier and his wife, played by J. Anthony Crane and Allison Guinn. Both were as hilarious as expected, turning “Master of the House” and the “Wedding Chorale” into deliciously raucous respites from an otherwise heavy night. 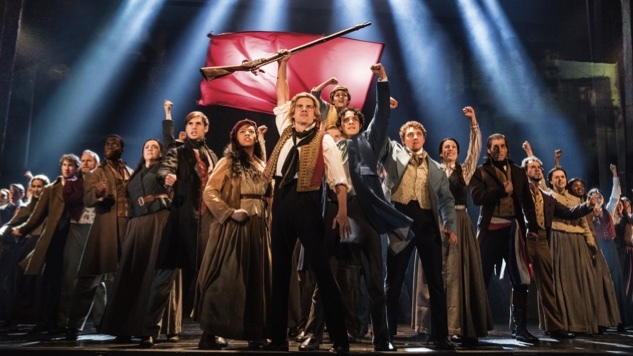 One of the longest-running productions on both Broadway and in the West End, where it eclipsed 10,000 performances in 2010, Les Misérables will undoubtedly continue to be revived in theater districts and tours around the world. And it will just as undoubtedly continue to make new fans of musicals for years to come.